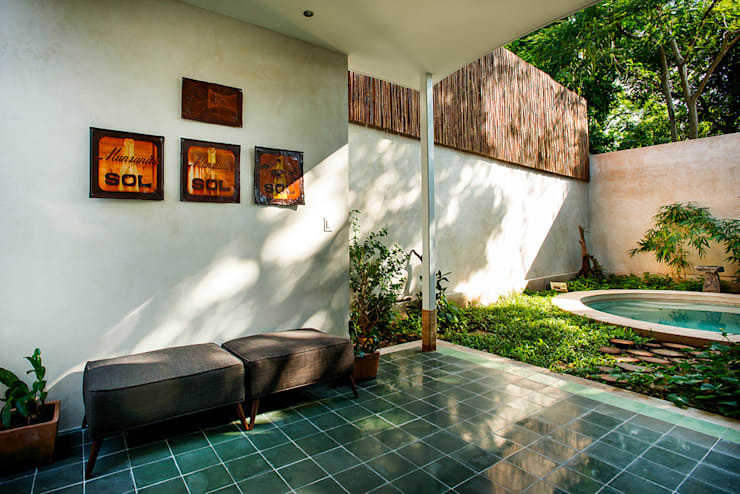 The most alluring part of this gorgeous Mexican home is the lush internal courtyard. The garden doesn't just act as a decorative backdrop; it feels like a truly integral part of the internal living areas and informs the entire aesthetic of the home. So it's a surprise to learn that the architects Taller Estilo began with an existing structure that was badly positioned and relatively closed off from the garden. The new owners wanted a home with a greater openness of space, but they also wanted to avoid making too many drastic changes or damaging the established garden. 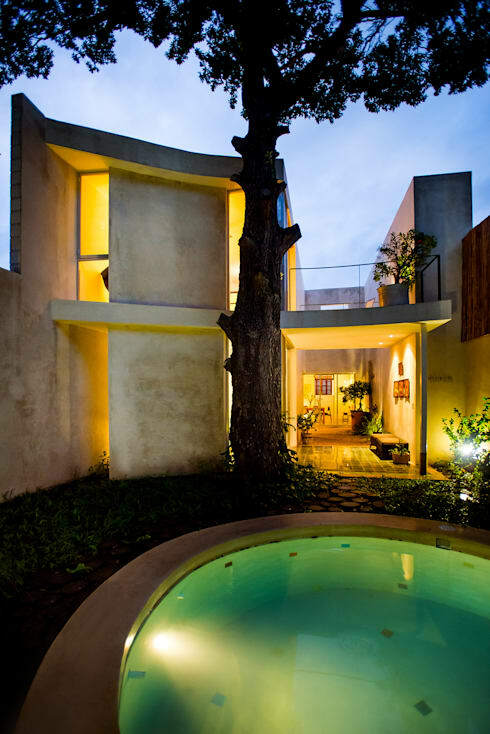 The home is located in Yucatan, Mexico and has a fairly private facade. It is common for homes here to have high-walled facades and this abode is fairly traditional in that sense. 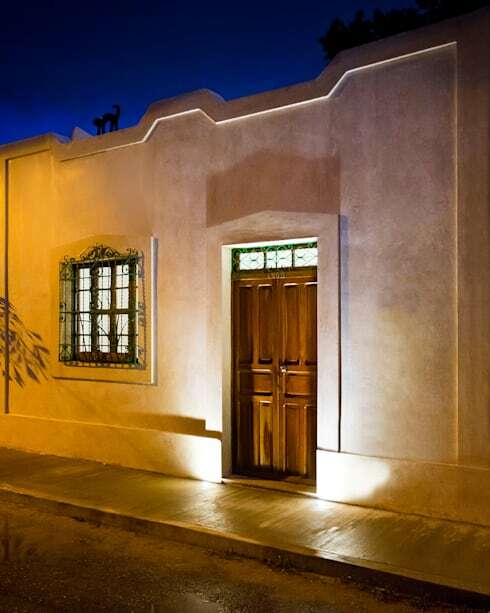 Nevertheless, the exterior is made warm and friendly with the use of golden wooden doors and an ornate roofline. 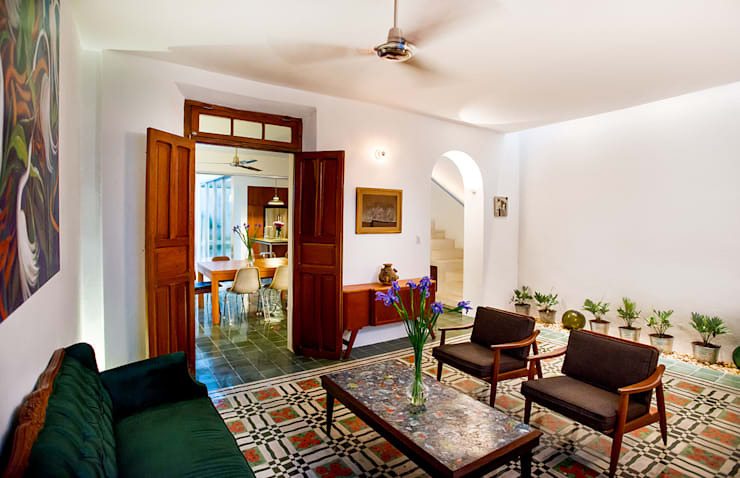 The existing structure was left largely untouched, and the living room has beautiful original Mexican floor tiles. These add a warm, cosy and colourful feel to the home. White walls and simple furnishings create an easy sense of flow that leads naturally to the more contemporary elements in the home. The architects added sliding glass doors that run from the floor to ceiling. 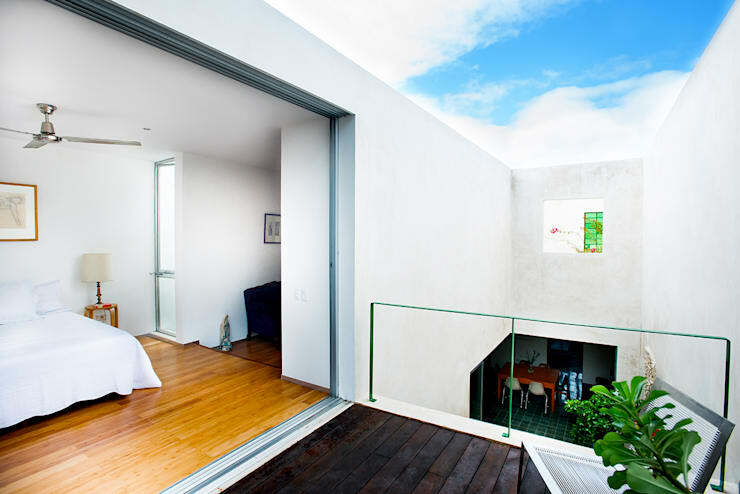 These open onto a private courtyard and allow for lots of light to penetrate the interior. 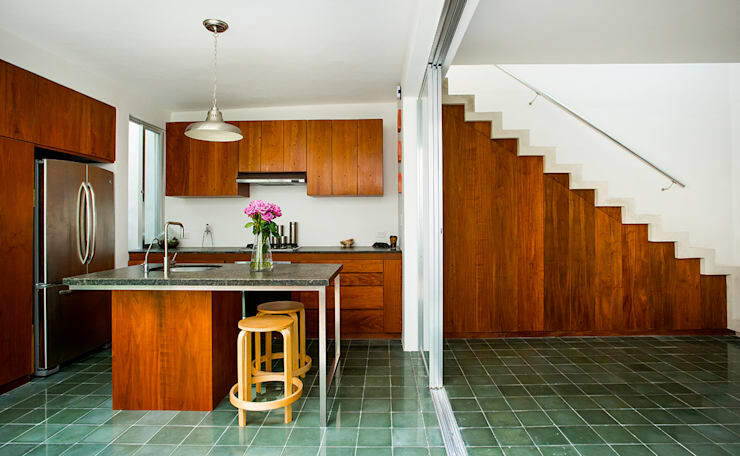 This is an important change because the previous incarnation of this home received little natural sunlight. 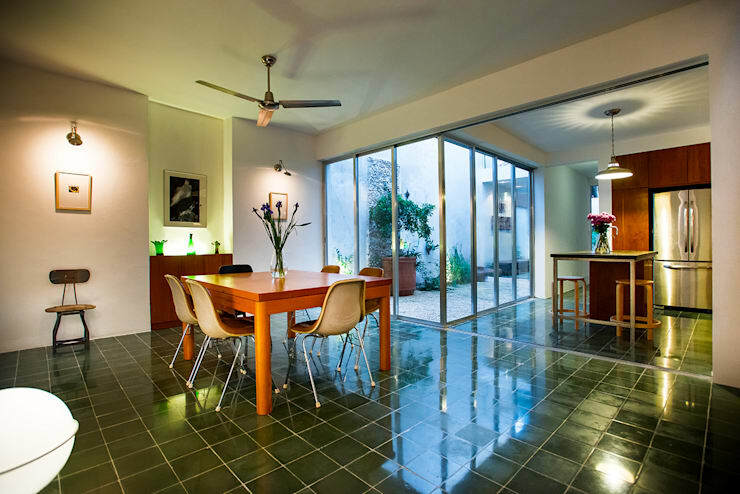 Note the use of dark green floor tiles. These are used throughout the home and reflect the ambience of the outside greenery. In a sense, they invite the outer world into the internal world of the home. The kitchen has been customised to maximise space and create a sense of bright airiness. The walls are white and the cupboards are very simply designed. We love how the cupboards have been designed to reach just below the ceiling and retain a constant sense of flow. Finally, the use of wood is a good touch and suits the natural feel of the home. A series of large openings have been installed to create an easy sense of flow between the internal and external areas. Here we see the transition point between the living room and the circular pool. The high-walled garden provides lots of privacy, while the dappled light adds a watery, dreamlike water quality to the turquoise floor tiles. 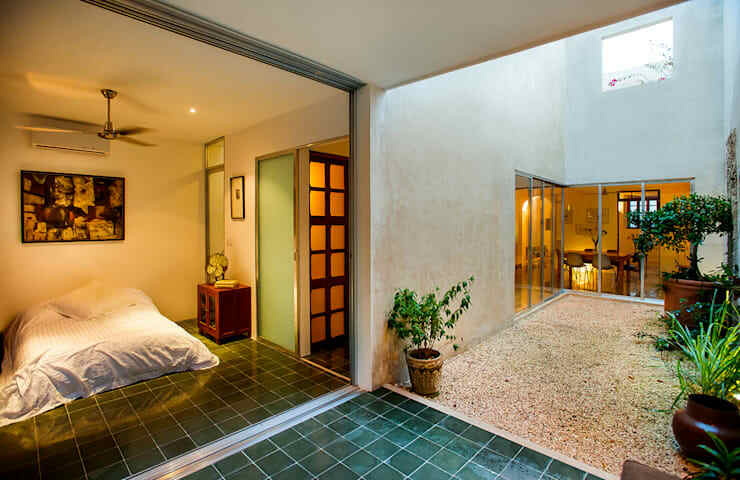 On the ground level, we have a green bedroom with its own terrace. 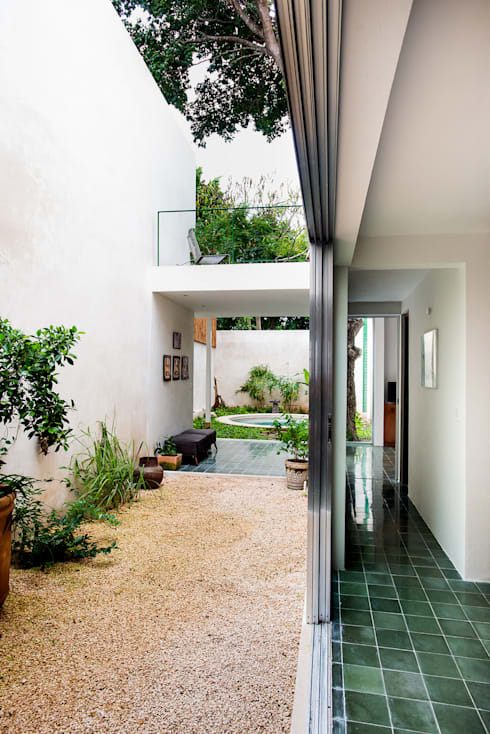 Both areas form a cohesive whole with the help of some green floor tiles. This is a bedroom with all the comforts of internal life and the spirit of a garden. On the upper level we have a bright bedroom with a fantastically light and private terrace. This room is a completely new construction and has all the makings of a master bedroom. At the rear of the home we have a better view of the curved wall of the new addition. It blends perfectly into the small garden and mimics the organic flow of the circular pool. If the green spaces in this home have inspired you, check out 11 of the best roof gardens we've seen. What do you think of the integration of internal and external spaces in this home? Let us know in the comments field below.